Again a little later than I had hoped for, but it’s been a busy week! This time it was work and not a video game so it’s a far more legit excuse. Anyways, here’s the second instalment of Altered Timescapes, my review of the work of Christopher Nolan and the role time plays in each film. 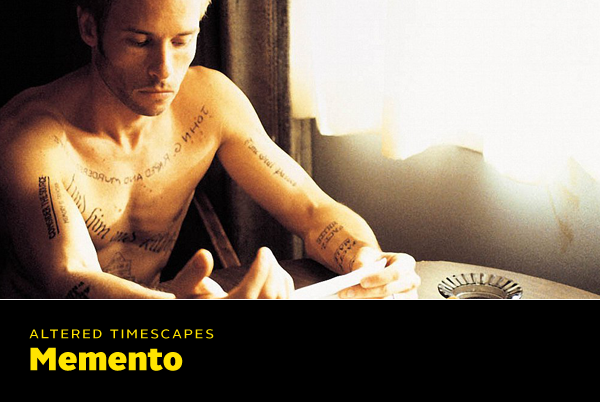 In this episode we’re taking a look at Nolan’s second film — and his announcement to the world of his talents — Memento. The film opens with a beautifully poetic shot of a Polaroid photo developing, only the footage is reversed — a fully developed photo slowly fades until the film is blank. This sequence is a great representation of the plight of the main character, Leonard Shelby, who cannot form new memories since an incident involving head injury and is required to rely on notes taken before he forgets (or is distracted from) the most recent occurrence. The protagonist’s inability to remember anything for more than a few minutes is one way time impacts upon the film: how can one function without the ability the sense of time or memory? 1. The timeline above illustrates the structure of the story’s presentation. The film opens with a brief sequence of the final ending, in colour, represented by the red Y to Z line. The film then introduces the second timeline, in black and white, showing the beginning of the story represented by the blue 1 to 2 line. The movie then continues to jump back and forth between the two. The colour sequences run Y to Z, X to Y and so forth because each consecutive colour sequence shown presents the scene previous to the last one — the future (colour sequences) is essentially running backwards. Meanwhile, the past runs forwards until the two collide in a brief sequence of what could be considered present time. 2. This second graphic illustrates what I mean above by the future running backwards and the past running forwards. 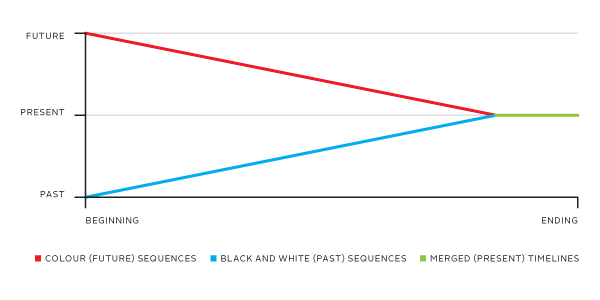 The X axis is the timeline of the movie itself, while the Y axis represents time within the story; the red line represents the colour sequences showing the future told from the end to the beginning, while the blue line represents the black and white sequences illuminating the past while running forward in time; the green line represents where the two timelines finally meet and we see the beginning of the end. As you can see, Memento is a truly creative film both in terms of structure and story. If you haven’t seen it before, do yourself a favour and check it out immediately. If you have seen it before and haven’t seen it in a while, it’s probably about time. Next up is Insomnia, another fantastic movie, which I’ll hopefully have up sooner than later.